Hello everyone! This is Peggy from The Decorating Files. I’m so delighted to be guest posting for Shannon today. 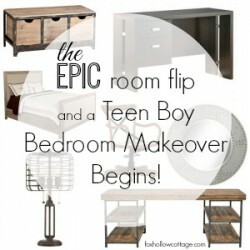 One of the projects I’m looking forward to working on in my house this year is my guest room. In the meantime, I’m putting together a file with lots of beautiful design ideas for it. However, the thing to keep in mind when decorating a guest room is that that there is something more important than the design of the room. It’s all about comfort and making your guests feel welcome. 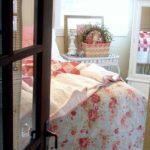 I thought I’d share a list of guest room essentials that will help you create an inviting place for your friends and family to stay. You want your guests to have a pleasant night’s sleep. Make sure you have a good quality mattress, one that you’d be willing to sleep on. If you don’t have a dedicated bed for guests, a nice air mattress can be very comfortable, too. Keep the bed linens simple and layered. You don’t have to break your budget on the linens to make your guests feel special. You can create a designer look for a fraction of the price by shopping at discount specialty stores. Make sure the sheets are freshly cleaned, use a light weight blanket, and have fluffy bed pillows. Provide your guests with extra pillows and blankets for their comfort. 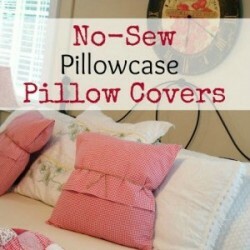 Keep decorative throw pillows to no more than three, so that they don’t have to remove a bunch of them each night. Have a table or desk next to the bed with an alarm clock or clock radio and a light. A comfy chair and ottoman will give your guests a place to relax and have a moment to themselves. This would be a great spot to have a reading lamp and some reading material. Fill a basket with books and magazines that you’ve read and your guests can take with them when they leave. It would also be nice to have a folding luggage rack or a dresser top cleared so they can place their suitcase on it. This will save them from having to bend over constantly to access the suitcase while it sits on the floor. In the closet, provide them with space to hang their clothes and some extra hangers. In the bathroom, have plenty of bath towels, hand towels, and facecloths available to them. You can find excellent quality towels for less at the same types of stores you find the sheets. Also, put together a basket of toiletries. You can purchase travel sizes at most discount stores. 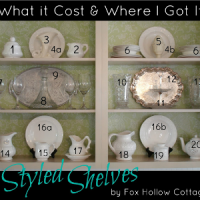 This will save your guests a trip to the store for any forgotten items. Nothing says welcome like a basket of treats. Your guests will appreciate having fresh fruits, packaged crackers, cookies and bottled water available to them in their room. If they like coffee, you could even set up a small coffee station with a single or two-cup coffee maker, cups, and all the fixings. They may want to enjoy a cup in the morning before they come out to see everyone. 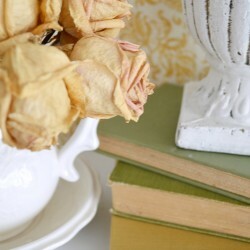 Something else that I always like to include in my house and guest room are fresh flowers. They brighten up any room. Though, you might want to find out if your guests have any allergies or breathing problems beforehand. If they don’t, find out which flower is their favorite. It would be a lovely touch to put those in their room. 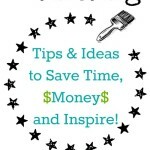 I really enjoyed sharing these tips and ideas with you today. I’d like to thank Shannon for asking me to do a guest post. 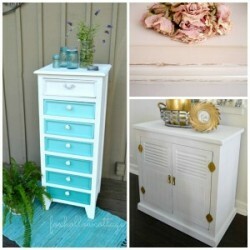 Stop by and visit me anytime at The Decorating Files! Get my room ready Peggy! Wow, she really knows all the tips and tricks for making guests feel welcome. If you want to see more of Peggy..
on facebook, pinterest & twitter. I’m sure she’d love to see you! Shannon I needed this,there is so much I want to do in the guest bedroom,I’ve moved the “office/computer” into the quest bedroom and now I need more storage,etc…hmmm. This was very interesting to me, Shannon. 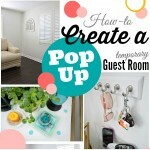 I am working on my guest room and really appreciate these ideas! Thanks! 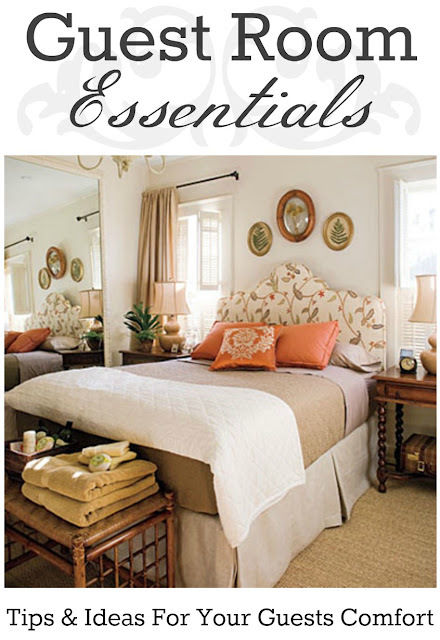 Guest Room Essentials; find tips and ideas for making your guests feel comfortable and welcome in this comprehensive article by Peggy from The Decorating Files.